Expect the extras ... Experience the extraordinary Exceeding your expectations is always our goal at the Butrinti Hotel. We go beyond superb accommodations, deluxe amenities and the city's best location to a new level of hospitality. Experience an extraordinary award-winning hotel. Each beautifully appointed guest room and suite features a spectacular view of Ionian See and the city skyline. Luxurious surroundings, exceptional features and deluxe amenities assure your satisfaction and comfort. 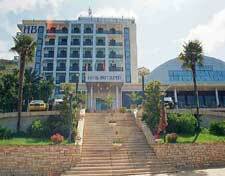 Designed from insight of meeting professionals, the Butrinti Hotel is known for exceeding expectations. Rich inlaid woods and imported marble immerse you in luxury. The staff provides unmatched service. Make your meeting more than a success. Make it a triumph. You'll find something to indulge your good taste. Distinctive restaurant,Pizzeria and Snack Bar satisfy every appetite for great dining and entertainment. Work away the day's pressure in our complete health club with modern exercise equipment. Take a relaxing swim in the pool, try a rejuvenating massage or sauna, and step into the great outdoors to run or take a spin on jogging and bike paths along sea side. The poolside bar compliment each end of the water system with tropical refreshments and hot barbecue specialties served throughout the day. A professional pool staff provides tanning consultation, towels.